Margarine is an emulsified, fatty food product originally created as a substitute for butter. 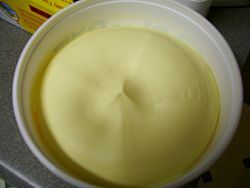 As an emulsion, margarine is a mixture of two immiscible (unblendable substances), involving a continuous liquid phase of fat surrounding droplets of water as the dispersed phase (water-in-oil emulsion). It is generally mixed with vitamins, coloring agents, emulsifiers, anti-spattering agents, flavorants, preservatives, and other ingredients in order to have nutritional value and similar taste and appearance as butter (Herbst 2001; Bender and Bender 2005). In the United States, a standard margarine product must contain at least eighty percent edible vegetable or animal fat (Herbst 2001). However, margarine sometimes is used as a generic term for any of a wide range of butter substitutes, including fat-free and low-fat spreads. In some regions of the world, people may refer to margarine as butter in informal speech, but (at least in the United States and the European Community) laws forbid food packaging to refer to margarine as "butter." Recipes sometimes refer to margarine as oleo or as shortening. The development of margarine, with its similar taste, appearance, and nutritional value as butter (produced from churned milk and cream) is the result of creative human investment, which has further produced a wide variety of types of margarine, including soft margarine, whipped margarine, liquid margarine, butter-margarine blends, and even cholesterol-lowering margarine. An unintended side-effect, however, can result from the hydrogenation process that converts the oils to a more stable chemical form. If the oils are only partially hydrogenated, some will become trans fats, which have been identified as being harmful to health. As this hazard has become known, manufacturers have developed production methods that significantly reduce or eliminate the trans fats. In many parts of the world, margarine has become the best-selling table spread, although butter and olive oil also command large market shares. Margarine is an ingredient in the preparation of many other foods. Margarine is a water-in-oil emulsion, as is butter. Originally, the manufacturing process utilized oleo oil from beef fat emulsified with water or milk. Modern margarine can be made from any of a wide variety of animal or vegetable fats, and is often mixed with skimmed milk, salt, and emulsifiers. Margarine made from vegetable oils is especially important in today's market, as it provides a substitute for butter that is both vegan and pareve. Common sources for the vegetable oils are maize, coconuts, olives, cottonseeds, and soybeans. Nearly all margarine is salted. Other ingredients commonly added to margarine include vitamin A, vitamin D, nutritive carbohydrate sweeteners, anti-spattering agents, preservatives, antioxidants, edible colorants, acidulants, alkalizers, flavorants, and sometimes vitamin E (Katz and Weaver 2003; Bender and Bender 2005). The Food and Drug Administration (FDA) of the United States established a "Standard of Identity" for margarine to be a product that contains at least eighty percent edible animal or vegetable fat; plus an aqueous phase of water, milk, milk products, or some combination thereof; plus such nutritional enhancements as vitamin A and edible protein (Katz and Weaver 2003). In terms of microstructure, margarine, as a water-in-oil emulsion, contains water droplets of typically 5-10 µm (1.9-3.9 millionths of an inch) diameter dispersed in a continuous mixture of oil (liquid) and fat (solid). The amount of solid fat in the continuous oil+fat phase determines the firmness of the product. In the relevant temperature range, saturated fats contribute most to the amount of crystalline (solid) fat, whereas monounsaturated and polyunsaturated fats contribute relatively little to the amount of crystalline fat in the product. Mono- and poly-unsaturated fats and oils can be transformed into suitable, crystalline substrates by the chemical process of hydrogenation, rendering the product solid at room temperature. The molecular structure of mono- and poly-unsaturated fats and oils includes long chains of carbon atoms in which most of the carbon-carbon bonds are single but some are double. The double bonds add bends and kinks to the chains, which means the chains cannot pack closely together and, in bulk quantities, they form oils, not solid fats. The hydrogenation process (indicated as "hydrogenated" or "partially hydrogenated" oils on a label) adds hydrogen atoms to the carbon chains, converting the double bonds to single bonds, essentially straightening out the chains so they can pack closely together and form solids. Manufacturers of margarine hydrogenate the unsaturated vegetable oils so they will become more solid and be usable as a component of margarine (Herbst 2001). Full hydrogenation results in saturated fats only, while partial hydrogenation leaves some of the original double carbon bonds in place, but unfortunately also converts some of the original cis (bent) double bonds to trans (straight) double bonds. Converting the cis bonds to trans bonds removes the bends in the chains that are essential for maintaining the fluidity of the fat used in the body. Both cis and trans double bonds are provided by the hydrogenation process, whereas most vegetable oils are in the cis configuration (Katz and Weaver 2003). "Traditional" margarines, which contain saturated fats and are mostly made from vegetable oils—for such uses as spreading on toast. Margarines high in mono- or poly-unsaturated fats, which are made from safflower, sunflower, soybean, cottonseed, or olive oil, and which are said to be healthier than butter or other types of margarine. Many other types of margarines are available. There are cholesterol-lowering margarines, which entered the market in 1999, and are said to lower cholesterol levels in the blood (Herbst 2001). These contain no hydrogenated trans fatty acids and are made with plant-derived compounds that are said to obstruct cholesterol absorption (Herbst 2001). There also is whipped margarine (which has air beaten into it, making it fluffy), soft margarine (made from all vegetable oils and spreadable when cold), and liquid margarine (soft enough to squeeze from a bottle), as well as reduced-fat margarines and fat-free margarines (Herbst 2001). Many popular table spreads today are blends of margarine and butter—something that was long illegal in countries including the United States and Australia—and are designed to combine the lower cost and easy-spreading of artificial butter with the taste of the real thing. Under European Union directives, margarine products cannot be called "butter," even if most of it consists of natural butter. In some European countries, butter based table spreads and margarine products are marketed as "butter mixtures." These "butter mixtures" comprise a significant portion of the table spread market. The brand "I Can't Believe It's Not Butter" spawned a variety of similarly-named spreads that can be found on supermarket shelves all over the world. With names like "Utterly Butterly," "You'd Butter Believe it," and "Butterlicious," these butter mixtures avoid the restrictions on labeling with marketing techniques that imply a strong similarity to real butter. Margarine was invented in 1869 by French chemist Hippolyte Mège-Mouriés. It came in response to the offer of a prize by Emperor Louis Napoleon III of France to anyone who could make a satisfactory substitute for butter, suitable for use by the armed forces and the lower classes (Wolfe 2000). At the time there was a desire to find an inexpensive and stable alternative for the then scarce and expensive butter (Herbst 2001). Mège-Mouriés invented a substance he called oleomargarine, the name of which became shortened to the trade name "margarine." The manufacturing process involved oleo oil, from beef tallow, being churned at 25 to 30 degrees Centigrade (77 to 86 degrees Fahrenheit) with water or milk. Later, other animal fats and vegetable oils were substituted in the process. Katz and Weaver (2003) report that Mège-Mouriés used the name margarine after the Greek word for "pearl-like," reflecting that the product had a pearly luster. Another source for the name is said to originate with the 1813 discovery by Michel Eugène Chevreul of "margaric acid." Scientists at the time regarded margaric acid, like oleic acid and stearic acid, as one of the three fatty acids, which, in combination, formed most animal fats. In 1853, the German structural chemist Wilhelm Heinrich Heintz analyzed margaric acid as being simply a combination of stearic acid and of the previously unknown palmitic acid. The name margaric acid was named after pearly deposits of the fatty acid from Greek margaron, meaning "a pearl-oyster" or "a pearl." Manufacturers produced oleomargarine by taking clarified vegetable fat, extracting the liquid portion under pressure, and then allowing it to solidify. When combined with butyrin and water, it made a cheap and more-or-less palatable butter-substitute. Sold as margarine or under any of a host of other trade names, butter-substitutes soon became a substantial market segment—but too late to help Mège-Mouriés: although he expanded his initial manufacturing operation from France to the United States in 1873, he had little commercial success. By the end of the decade artificial butters were available commercially in both the Old World and the New World. From that time on, two main trends would dominate the margarine industry: on one hand a series of refinements and improvements to the product and its manufacture, and on the other a long and bitter struggle with the dairy industry, which defended itself from the margarine industry with vigor. As early as 1877, the first U.S. states had passed laws to restrict the sale and labeling of margarine. By the mid-1880s, the United States federal government had introduced a tax of two cents per pound, and devotees needed an expensive license to make or sell the product. Individual states began to require the clear labeling of margarine, banning passing it off as real butter. The key to slowing margarine sales (and protecting the established dairy industries), however, emerged as restricting its color. Margarine naturally appears white or almost white: By forbidding the addition of artificial coloring-agents, legislators found that they could keep margarine off kitchen tables. Bans on coloration became commonplace around the world and endured for almost 100 years. It did not become legal to sell colored margarine in Australia, for example, until the 1960s and as of 2005 it was still illegal to sell margarine with coloring in Quebec, Canada (CBC 2005). In the United States, the color bans began in the dairy states of New York and New Jersey. In several states, the legislature enacted laws to force margarine manufacturers to add pink colorings to make the product look unpalatable, but the U.S. Supreme Court struck down New Hampshire's law and overruled these measures. By the start of the twentieth century, eight out of ten Americans could not buy yellow margarine; and those who bought it had to pay a hefty tax on it. Bootleg colored margarine became common, and manufacturers began to supply food-coloring capsules so that the consumer could knead the yellow color into margarine before serving it. Nevertheless, the regulations and taxes had a significant effect: The 1902 restrictions on margarine color, for example, cut annual U.S. consumption from 120 million to 48 million pounds (54.4 million to 21.8 million kilograms). However, by the end of the 1910s, it had become more popular than ever. With the coming of World War I, margarine consumption increased enormously, even in unscathed regions like the United States. In the countries closest to the fighting, dairy products became almost unobtainable and were strictly rationed. The United Kingdom, for example, depended on imported butter from Australia and New Zealand and the risk of submarine attack meant that little arrived. Margarine became the staple spread, and butter a rare and expensive luxury. The long-running battle between the margarine and dairy lobbies continued: In the United States, the Great Depression brought a renewed wave of pro-dairy legislation; the Second World War, a swing back to margarine. Post-war, the margarine lobby gained power and, little by little, the main margarine restrictions were lifted, the last state to do so being Wisconsin in 1967. Margarine, particularly polyunsaturated margarine, has become a major part of the Western diet. In the United States, for example, in 1930 the average person ate over 18 lb (8 kg) of butter a year and just over two lb (900g) of margarine. By the end of the twentieth century, an average American ate just under four lb (1.8 kg) of butter and nearly 8 lb (3.6 kg) of margarine. The United States imports 10 billion pounds (4.5 billion kilograms) of margarine a year. Additionally, the United States exports 2 billion pounds (907 million kilograms) of margarine annually. Margarine has a particular market to Orthodox Jews. The laws of Kashrut (the Jewish dietary laws) forbid the mixing of meat and dairy products, and hence there are strictly Kosher margarines available, which are often used by Jews adapting recipes that use meat and butter to be Kosher. Discussions concerning the nutritional value of margarine revolve around two aspects: the total amount of fat, and the types of fat (saturated fat, trans fat). A complicating factor is the historic link in the United States between amounts of saturated fat and trans fat due to the very limited number of vegetable oil sources used there (esp. soy bean oil), but not in most other parts of the world. Usually, a comparison between margarine and butter is included in this context as well. Overall fat consumption in the Western world is quite high. Traditional margarine (~80 percent fat) contributes to this, but is not the main factor causing over-consumption. Low-fat spreads could serve as an alternative, and are widely available. The roles of butter and margarine are quite similar with respect to their energy content. A fatty acid is a type of carboxylic acid in which the carboxylhead is combined with a long-chain fat molecule. Three fatty acids combined with the three-carbon molecule glycerol form the triglycerides, which play many important roles in the body. The saturated fatty acids in triglycerides contribute to elevated blood cholesterol levels (Keys et al. 1965; Mensink et al. 2003), which in turn has often been linked to cardiovascular diseases. Vegetable fats can contain anything between 10 percent and 100 percent saturated fatty acids. Liquid oils tend to be on the low end (unhardened canola oil, soy bean oil, etc. ), fully hardened oils are at the high end of the scale. A margarine blend is a mixture of both types of components, and will rarely exceed 50 percent saturated fatty acids on fat. Exceptions are some traditional kitchen margarines or products that have to maintain stability under tropical conditions (de Bruijne and Bot 1999). Generally, firmer margarines contain more saturated fat. Regular butterfat contains ~65 percent saturated fatty acids, although this varies somewhat with season. One tablespoon of butter contains over seven grams of saturated fat. Several large studies have suggested a link between earlier death and consumption of high amounts of trans fat (Willett et al. 1993; Hu et al. 1997; Hayakawa et al. 2000). The United States Food and Drug Administration (FDA), the National Heart, Lung and Blood Institute, and the American Heart Association (AHA) all have recommended people to limit intake of trans fat. While trans double bonds are not unknown in nature, occurring in some animal fats and many plant fats, the double bonds in most vegetable oils are in the cis configuration (Katz and Weaver 2003). Partial hydrogenation causes migration of the double bonds of vegetable oils and results in both cis and trans double bonds (Katz and Weaver 2003). Unlike cis double bonds, where the hydrogen atoms attached to the carbons that form the double bond are on the same side of the carbon chain (allowing the molecule to bend at the double bond), in trans double bonds the hydrogen atoms are on opposite sides of the carbon chain and the molecule has a more linear configuration, like that of a saturated fatty acid (Katz and Weaver 2003). Full hydrogenation does not generate trans fats, but only fully saturated fats. Particularly in the United States, partial hydrogenation has been common as a result of the dependence on a very limited number of vegetable oil sources. In other parts of the world, the industry started to move away from using partially hydrogenated oils since the mid-nineties (Flöter and van Duijn 2006), and instead to produce new margarine varieties that contain less or no trans fat (van Duijn 2005). Many manufacturers in the United States now label their products according to government regulations as "zero grams" trans-fat, which effectively means less than 500 mg trans-fat per serving. Butterfat contains 2-5 percent trans fatty acids (mainly C18:1w7, i.e. an 18 carbon fat molecule with one trans double bond starting with the seventh carbon atom from the unattached end of the molecule) (Anand et al. 2004). Dietary intake of cholesterol itself is not the key factor influencing levels of cholesterol in the blood, due to regulatory mechanisms; rather the key dietary factor is consumption of saturated fats. This is because a higher intake of cholesterol from food leads to a net decrease in endogenous production, while lower intake from food has the opposite effect. Nonetheless, the FDA states that healthy people should not consume more than 200 mg of cholesterol each day. Butter contains approximately 33 mg of cholesterol in each tablespoon. Margarine contains no cholesterol. However, the human body transforms saturated fat into cholesterol. Anand, P. S., C. A. Avramis, J. K. G. Kramer, and A. G. Marangoni. 2004. "Algal meal supplementation of the cows' diet alters the physical properties of milk fat." J. Dairy Res. 71, 66-73. Canadian Broadcasting Corporation. 2005. Canada's conflicted relationship with margarine. CBC News Online March 18, 2005. Retrieved September 23, 2007.
de Bruijne, D. W., and A. Bot. 1999. "Fabricated fat-based foods." in A. J. Rosenthal, Food Texture: Measurement and Perception. Gaithersburg: Aspen. ISBN 1591248124. Flöter, E., and G. van Duijn. 2006. "Trans-free fats for use in foods." in F. D. Gunstone, Modifying Lipids for use in Foods. Cambridge, UK: Woodhead. ISBN 1855739712. Hayakawa, K., Y. Y. Linko, and P. Linko. 2000. "The role of trans fatty acids in human nutrition," Journal of Lipid Science and Technology 102: 419-425. Hu, F. B., M. J. Stampfer, J. E. Manson, E. Rimm, G. A. Colditz, B. A. Rosner, C. H. Hennekens, and W. C. Willett. 1997. Dietary fat intake and the risk of coronary heart disease in women. New England Journal of Medicine 337: 1491-1499. Retrieved September 23, 2007. Keys, A., J. T. Anderson, and F. Grande. 1965. "Serum cholesterol response to changes in the diet. IV. Particular fatty acids in the diet." Metabolism 14: 776-787. Mensink, R. P., P. L. Zock, A. D. M. Kester, and M. B. Katan. 2003. "Effects of dietary fatty acids and carbohydrates on the ratio of serum total to HDL cholesterol and on serum lipids and apolipoproteins: A meta-analysis of 60 controlled studies." American Journal of Clinical Nutrition 77: 1146-1155.
van Duijn, G. 2005. "Technical aspects of trans reduction in modified fats, Oléagineux, Corps Gras." Lipides 12: 422-426. Willett, W. C., M. J. Stampfer, J. E. Mason, G. A. Colditz, F. E. Speizer, B. A. Rosner, L. A. Sampson, and C. H. Hennekes. 1993. "Intake of trans fatty acids and risk of coronary heart disease among women." Lancet 341: 581-585. Wolfe, E. 2000. Sciencepower 9: Science, Technology, Society, Environment. Toronto: McGraw-Hill Ryerson. ISBN 0075609053. This page was last modified on 30 September 2008, at 20:40.